Korker Bow Tutorial - Peek-a-Boo Pages - Patterns, Fabric & More! 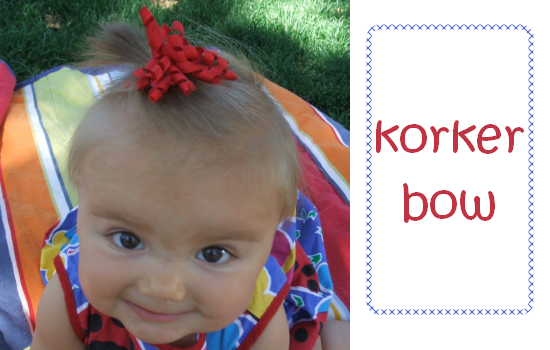 I really love korker bows- they are super easy, cheap, and just plain cute! *Remember anything you use needs to be oven safe and when you get it out it will be hot, so be careful! 2. After everything has cooled down, slide your ribbon off the knitting needles and cut into chunks. Mine were about 2″ but you can make yours bigger or shorter depending on the bow shape you’re going for. Seal the ends with clear nail polish or a lighter to prevent fraying. 4. Hot glue onto a hair clip and you’re done! Previous Post: « Cheerleader Dress Tutorial! Go Team! Your baby is the cutest. Thanks for the tutorial :). I’ve always wonder how to make these. Thanks for the tutorial. I featured this post on my blog if you’d like to check it out. How original ! Must try it. Way adorable!! I wish I would have known to make these when my little girl was so itty….they’re just priceless on their cute tiny heads 😀 I’m happy to be your newest follower of your delightful blog and I’d love to have you as a friend at FrouFrou Decor! I would also like to invite you to show off your sweet creations each Friday at my Fabulous Friday Finds party! Hope to see you there!